On its third ZOHO release, the Jay Willie Blues Band from Connecticut lay down 12 vintage Texas Blues, Rock and ballad tracks, inspired by the incendiary guitar and slide guitar work of Texas Blues legend Johnny Winter. 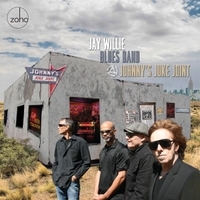 The recording of Johnny's Juke Joint was encouraged by our continued success and worldwide rave reviews associated with the Jay Willie Blues Band's previous releases, The Reel Deal, New York Minute (ZOHO Roots, 2013), and Rumblin’ and Slidin’ (ZOHO Roots, 2014). The band is proud of such recognition as well as the frequent airplay on Sirius XM BB Kings Bluesville. It is no secret and probably redundant to mention the huge influence Johnny Winter has exerted over our recordings in many ways. We are honored to have with us on this album his former band mate Bobby T Torello on drums and Jason Ricci who is featured on Johnny’s 2014 Grammy-winning CD “Step Back”. It was shocking and very sad to learn of Johnny Winter’s passing on July 16, 2014. During the pre-production of Johnny's Juke Joint, there was some discussion of producing a tribute CD to the compositions of this late great blues legend. After further consideration, we realized that all of our music is in a sense a tribute to Johnny. As Johnny's originality and individualism is unparalleled, a direct interpretation of his work in the style of a "covers band" would not do him justice. We did include one original JW track titled I Love Everybody from his 1969 studio album ” Second Winter”. This is in my opinion one of the rawest examples of both Johnny’s powerful vocal ability and slide guitar mastery. Our individual approach to the originality of I Love Everybody was to include our new, featured vocalist Malorie Leogrande on this track. Malorie is also featured on four additional tracks including the 1965 Sam the Sham and the Pharaohs mega-hit Wooly Bully, Jimmy Reed's You Got Me Dizzy, Lil’ Bob and the Lollipops' Nobody But You, and the Jay Willie original Upside Of The Ground. Malorie offers a stunning, high-energy youthful approach, combined with the professionalism and experience you’d expect from a seasoned veteran. Malorie is an internationally-performing five-octave range vocalist and holds a MALS in Arts and Humanities from Wesleyan University, Connecticut. We are excited to include for the third consecutive release our featured artist Jason Ricci on harmonica. Jason graciously told me that the Jay Willie Blues Band should consider him as its harmonica player for all our recording needs, and he is proud to be included. The incorporation of Jason’s incredibly powerful playing has been a very significant compliment to the tracks that he is featured on. I am also proud of Jason and his strength to overcome his life challenges and being back on tour, exceeding the expectations of his fans worldwide. Jason is featured on four tracks, including Wooly Bully, You Got Me Dizzy, James Cotton’s One More Mile, and Robert Johnson’s Me And The Devil. Our regular gigging band consists of Jay Willie guitar, slide guitar and vocals, Bobby T Torello drums and vocals, Bob Callahan, guitar and vocals, Steve Clarke, Bass, and Teddy Yakush, saxophone and harmonica. Each of the album's track selections have a story that is relevant to our band members. For instance: Bobby T performed with Junior Wells during a gig at Chicago’s legendary Checkerboard Lounge, and he does a great vocal rendition of Juniors’ I Got A Stomach Ache. Succotash is a high energy jam that Johnny Winter, Bobby T, and Jon Paris often opened a show with. One More Mile is a funky, classic James Cotton tune, and we felt it would be very interesting to hear how a contemporary harpist would interpret it, and Jason Ricci rose to the occasion and went the extra mile. Wooly Bully is a cover of an iconic classic song. To differentiate our arrangement from the 1965 original, we incorporated the powerful and expressive vocals of Malorie Leogrande, and we asked Jason to put his virtuosic harmonica icing all over it. Again the result is for an exciting and unique personalized rendition. People Get Ready My loving brother Tod Willie is a featured vocalist on this track and for good cause. This is a very deep and inspirational song. Tod, Bob Callahan and I spent several years in a successful cover band together and we were always blessed to have an assembly of loving family and friends. This song is dedicated to our parents Andy and Rita who are responsible for the procreation of the majority of that assembly. Produced by: Jay Willie. Recorded by: Nathan Sage at Whitehouse Productions, Shelton, CT, from July 2014 to February 2015. Jason Ricci harmonica overdubs recorded by: Rich Morpurgo at Midwest Audio Recording, Bloomington, IN. Mixed and mastered by: Dan Coutant at Sun Room Audio, Hudson Valley, NY, in March 2015. Photography for Malorie Leogrande by: Dennis Kwan. Art direction, design and photography by: Jack Frisch. Executive producer: Joachim "Jochen" Becker.